Dobie, Edith. The Political Career of Stephen Mallory White: A Study of Party Activities Under the Convention System. 1927. Reprint. New York: AMS Press, 1971. Grassman, Curtis Edwin. Prologue to Progressivism: Senator Stephen M. White and the California Reform Impulse, 1875-1905. Ph.D. dissertation, University of California, Los Angeles, 1970. Mosher, Leroy E., and Robert W. Gates. 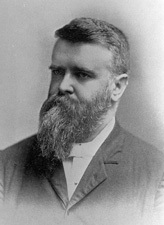 Stephen M. White, Californian, Citizen, Lawyer, Senator. His Life and His Work. 2 vols. Los Angeles: Times-Mirror Co., 1903. Taggart, Harold Francis. The Senatorial Election of 1893 in California. California Historical Society Quarterly 19 (March 1940): 59-73.